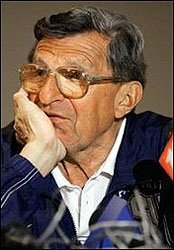 Hello, I’m Joe Paterno, and I’d like to ask you a question: Are you prepared to die? Are you so old that folks often mistake you for Methuselah? Did you actually go to high school with Jesus Christ? Is so, then you should be coming to the I. Plantem Funeral Home. At I. Plantem, quality is job number one. Johnny, my caring sales representative asked me, “What do I have to do to put you in the ground today?” They hooked me up with a terrific package which guarantees I will be buried in my glasses and short pants under the turf at Beaver Stadium. How’s that for service? And, since I already look deceased, I received 20% off my order! Well, that’s just the cat’s pajamas! As the head football coach at Penn State University, I have made many enemies. Most are struggling Division 1-AA squads that I ran the score upon. Heck, just ask Rutgers’ head coach how he felt after I completed a successful trick punt when we were already up by thirty points! Thankfully, the good folks at I. Plantem are above such grudges. They treated me like a human being – which must be difficult, since I am a despicable man. I heartily endorse their product. I. Plantem Funeral Homes: We Put The “Fun” In Funeral! Tell ‘em Joe Pa sent ya!